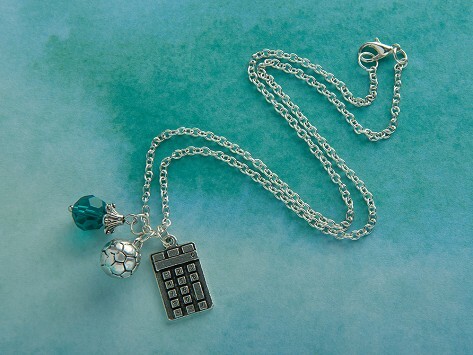 This kid’s charm necklace encourages girls to follow their passion and showcase their interests. Each is one is put together by a kid Maker in Boston to help other girls feel good about showcasing their interests—from reading and running to astronomy and math. A duo of sweet charms is complemented by a sparkly bead. Dimensions: 0.6" x 3.5" x 1"
My granddaughter and I both loved it. A unique gift item for girls that inspire all of us. It was a gift for my granddaughter and she seemed happy when she received it. Marlie Kass created her take on a kid's charm necklace to encourage girls to be proud of their interests. Marlie wants to help girls like herself defy the typical stereotypes—you’re either a princess or a tomboy—and prove that they don’t have to fit into any particular category. Thirteen-year-old Marlie is all about self-expression and her necklaces are a sweet combination of sparkle and smarts that showcase what a girl is into. The charms she selects aren’t for the cookie cutter crowd but are for girls who are thinking outside of the box and appreciate pretty things, too. Each necklace has a theme like reading, math, running, or Marlie’s favorite: a "dream big"-inspired set of charms that encourages girls to reach for the stars—maybe even literally. Marlie began Smart Girls Jewelry when she was 10. Three years later, she’s still happily at work putting necklaces together at home in Boston.